Wine-Ratings are of great value to our estate as a whole, this important information and feedback helps us to monitor our production quality and the consumtion trends and wishes of our valued customers – the information below to various Bollig-Lehnert Vintages is offered as a guide only..
Savory tones of smoke and crushed earth permeate from nose to finish, suggesting a complex auslese that’s more mineral than fruit. Still, vibrant lemon-lime acidity and silken streaks of honey penetrate the midpalate and extend through a long, invigorating finish. It drinks well now but should show even better from 2021. Intense aromas of smoke, crushed earth and pollen permeate through sweet-tart lemon and lime flavors. It’s savory yet invigorating, offering penetrating streaks of acidity that linger through a long finish. Voluptuous, slightly overripe notes of yellow peach, pineapple and red berry are accented by caramel and smoke in this off-dry kabinett. High-toned acidity lends balance to the midpalate leading to a refreshingly mineral finish. Initial aromas of smoke and savory dried herb blow off to reveal crisp yellow peach, apple and blossom in this wine. Off-dry in style, it’s crunchy and spry, with a spicy, earthen finish. A fresh and zesty style, with notes of dried sage and thyme to the green peach and pippin apple flavors. The pure finish is loaded with minerality, offering hints of white pepper. Drink now through 2025. 700 cases made. Zesty and savory, with good cut to the white berry and currant flavors, accented by slate and minerally notes. Dried sage details show on the finish. Drink now through 2019. 440 cases made. Whiffs of caramel and peach preserve introduce this sweet but elegantly balanced Riesling. Stone fruit and melon flavors are deeply concentrated on the palate, accented by hints of spice and pollen, along with a reverberating spine of acidity. Light footed and finely textured, it’s an excellent value for such a well-made Auslese. Intense smoky, slatey complexities lend an earthy rusticity to this wine’s punchy tangerine and grapefruit flavors. It’s sunny and sweet yet neatly balanced with crisp lemon-lime acidity. Drink now through 2021. Initial pronounced smoke and struck match aromas blow off with aeration, revealing fresher green apple and lime notes. As it opens, lip-smacking hits of honey and sweet tangerine come to the fore. Drink now through 2020. Smoke and flint notes on the nose introduce this energizing Riesling. On the palate, zingy lemon and tangerine flavors are softened by a sweet veil of honey and stone fruit. It’s a slender, fine-footed wine but offers exhilarating refreshment. Intensely earthy at first, aeration opens up the nose of this rather savory off-dry Riesling, revealing fresher notes of lemon and lime peels. It’s delicate in concentration, but tart green apple and citrus flavors are zestful. Savory wisps of smoke and dusty minerals juxtapose exuberantly juicy, sweet yellow peach and nectarine flavors in this crystalline kabinett. Just off-dry on the palate, its refreshing, high-spirited style makes it an excellent apéritif. Smoke seeps throughout this deeply earthen Auslese, lending a savory, mineral tone to the bright lemon and tangerine flavors. The palate is honeyed and concludes deftly with a tea-leaf astringency that lingers on the finish. Savory aromas, with flavors of dried green herb, nectarine and fresh-cut apple. Rich and minerally on the well-spiced and crunchy finish. Drink now through 2024. 720 cases made. Crisp apple and pears are streaked with earthy tones of saffron and bramble in this brisk invigorating Spätlese. It’s concentrated and fruity on the palate with a clingy honeyed touch that extends the finish. Whiffs of pine fronds and green melon rinds lend a brisk, tonic feel to this off-dry Riesling. It’s racy and fresh with acidity, but wraps up briskly and without a trace. Smoke and dried herbs persist from nose to finish on this uniquely sweet-savory auslese. The palate is brisk and lemony, but shaded in tones of dust and stone that linger on the finish. 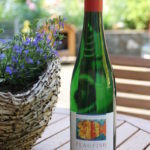 Delicate and racy, yet intensely penetrating with peach and lemon flavors, this off-dry Riesling achieves satisfying balance. The palate is smooth and finishes long on a sultry smoke tone. Quite ripe, with peach and apple cobbler flavors that are well-spiced. A touch fat shows on the creamy finish. Drink now. 200 cases made. Offers peach, candied apricot, plum and white currant flavors that are quite lacy in texture. Creamy notes linger on the rich, elegant finish, with hints of savory herb and mineral. Drink now through 2035. 110 cases made. Delicate aromas and flavors of fresh-cut apple, elderflower, honeysuckle and red peach are fully expressed in this version, supported by plenty of fresh acidity. Finishes with melon and mineral accents. Drink now through 2035. 110 cases made. An expressive style, with ripe apple, pear and cream flavors on a broad structure, flanked by plenty of spicy notes. The gauzy finish is filled with pastry notes that linger with hints of rose petal and graphite. Drink now through 2032. 220 cases made. This white features a slightly floral aroma, with rich, unctuous flavors of ripe nectarine and fig alongside hints of mango. Long and creamy on the finish, where this displays notes of white chocolate. Drink now through 2026. 220 cases made. Apple compote and black currant flavors are present, accompanied by hints of pineapple. Finishes with delicate spicy notes that are framed by plenty of pastry accents. Drink now through 2024. 660 cases made. Offers a silky mouthfeel, with Granny Smith apple and ripe melon flavors that are crisp and feature notes of lemon zest. Light and juicy on the finish, showing hints of salt to the kiwifruit accents. Drink now through 2018. 300 cases made. Hints of yuzu citrus and smoke entice on the nose of this puckery tangerine-inflected Riesling. Off-dry in style, it’s enriched by luscious streaks of honey and sweet grapefruit on the midpalate. Finishes moderately long on a kiss of blossoms. Crushed rock and bramble lend an earthy tone to this off-dry, but somewhat savory spätlese. It’s refreshing and punchy, with a pleasantly bitter lemon-zest finish. Drink now.